The usual formulation of position determination involves four unknowns: three physical dimensions (X,Y,Z) and the satellite-receiver time offset. In cases where we can observe five or more pseudoranges, one might well ask if the redundant pseudoranges could be used to check the consistency among the observations —the fundamental principle behind receiver autonomous integrity monitoring (RAIM). 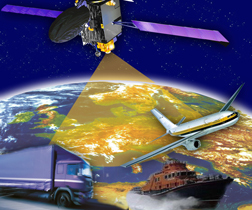 RAIM is a major technique for GNSS in many safety-critical applications. It has been with us since about 1990. Much of the material presented in the following relies on the work by B. Pervan cited in the Additional Resources section near the end of this article. At http://www.nstb.tc.faa.gov/Terms.html readers may find the following definition of HPL: The Horizontal Protection Level is the radius of a circle in the horizontal plane with its center being at the true position which describes the region that is assured to contain the indicated horizontal position. Under a normal condition (NC), the position error ||δx|| does not exceed the protection level a, and the residual is smaller than the threshold R, as in case III. If the position error does not exceed the protection level a, but the residual is larger than the threshold R, a false alarm (FA) has occurred, which is case IV. When both protection level and residual threshold have been breached, a detection failure (DF) has occurred — case I. Finally, a missed detection (MD) happens when the position error ||δx|| is larger than the protection level a, but the residual is smaller than the threshold R; that is case II. Input to RAIM: The variance σb2 of a pseudorange observation, the coefficient matrix A of the linearized least-squares observation equations, and the maximum allowable probabilities for a false alarm P(FA) and a missed detection P(MD). Output of the algorithm: Horizontal protection level (HPL), which is the radius of a circle, centered at the true position that is assured to contain the indicated horizontal position with the given probability of false alarm and missed detection. Similarly for Vertical Protection Level (VPL). Again, an official definition (at http://www.nstb.tc.faa.gov/Terms.html) is: The vertical protection level is half the length of a segment on the vertical axis with its center being at the true position, which describes the region that is assured to contain the indicated vertical position. The original Easy Suite can be found online at http://kom.aau.dk/~borre/easy/. The complete set of Easy Suite II Matlab codes can be found in compressed (“zipped”) files at http://gps.aau.dk/~borre/easy2.